Benteng Heritage is one of the few private museums in Indonesia. 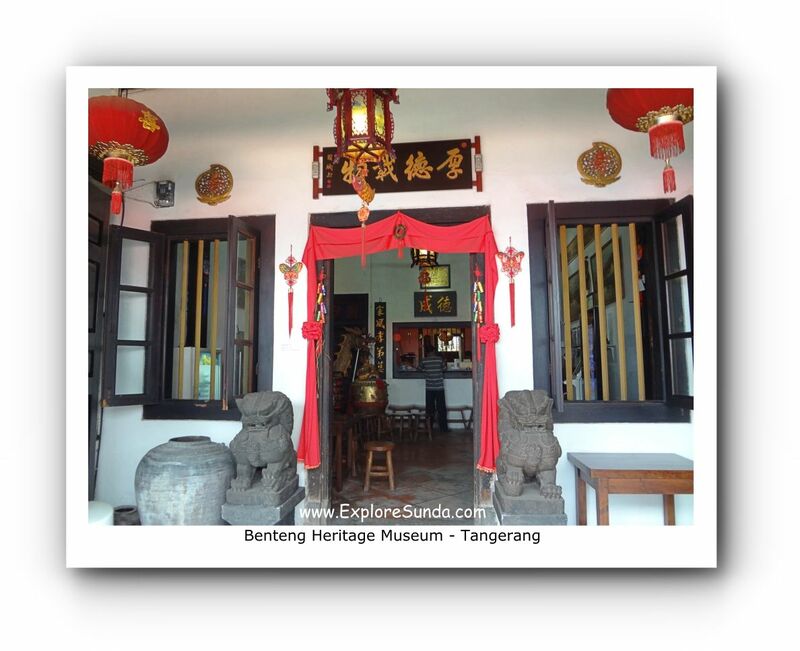 Its private collection presents the history of Indonesian Chinese in Tangerang, also known as China Benteng. Benteng is an Indonesian word for a fortress. The fortress in Tangerang refers to a fortress built by Dutch in 1705 to defend Batavia (Jakarta) against the attacks from sultanate of Banten in western Java. This fortress is known as Benteng Makassar. Makassar is an area in Sulawesi (Celebes) island in eastern Indonesia. The fortress is called Benteng Makassar because the Dutch recruited people from Makassar as an army there. The location of this fortress was close to Tangerang’s china town, which is centered at the Old Market. So, China Benteng refers to the Indonesian Chinese who live near this fortress. However, the Chinese has settled down there long before the Dutch. The oldest manuscript that mentioned the arrival of Chinese to Java island is a Sundanese manuscript called Tina Layang Parahyang (or Notes from Parahyangan, where Parahyangan refers to the land of Sunda). It recorded the arrival of the first Chinese fleet led by Chen Cie Lung (Ha Lung) on 1407. They landed at the mouth of Cisadane river called Teluk Naga (Dragon’s Bay) Tangerang and many settled down along Cisadane river. Chen Cie Lung’s fleet was part of Admiral Zheng He (Ceng Ho) fleet. Although Benteng Makassar has long gone, the Indonesian Chinese in the area is still known as China Benteng. 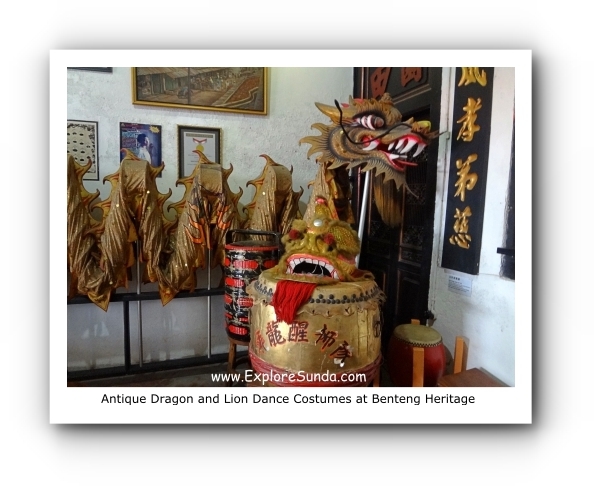 We can learn a lot about their culture in Benteng Heritage Museum. Jalan Cilame no. 18-20, Tangerang. 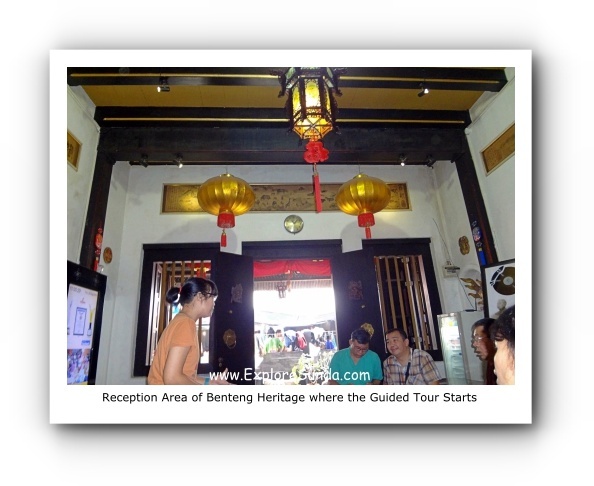 Benteng Heritage resides in a restored old Chinese house, that was built around 17th century. It is a typical Chinese 2 story house in the heart of Tangerang’s down town. It’s right in the middle of traditional market called Pasar Lama (Old Market). No wonder coming here is a bit tricky, somehow it is hidden behind vegetable sellers’ stand. 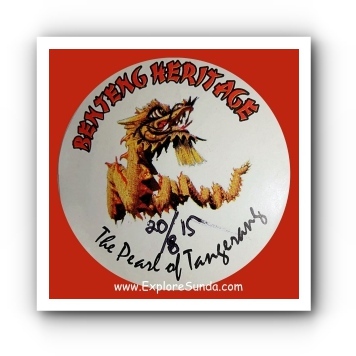 Once we have paid the ticket and filled in the guest book, we will receive a Benteng Heritage sticker as the entrance ticket. Then we will be seated at the reception area, waiting for the guided tour. The tour takes approximately 45 minutes and it is held every hour. We are not allowed to roam inside the museum by ourselves. The museum staff starts her explanation in the reception area, explaining the intention of this museum to preserve the cultural heritage in Tangerang. She also tells us the stories behind each portrait hanging in the wall. 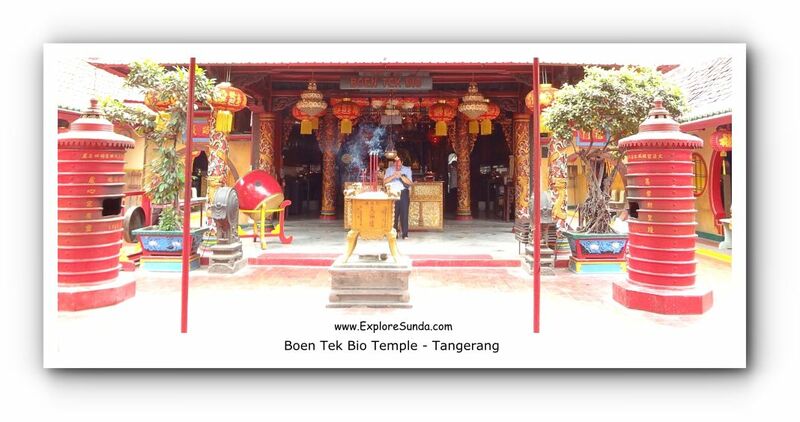 Some of the portraits depict the landmarks in the old Tangerang, others show the cultural activities. Nowadays, the cultural activities are still celebrated. The most prominent activity is the dragon boat racing at Cisadane river. In addition to the boat racing, some ducks are also released in the river, good luck will be upon whoever can catch these ducks. It is held annually at the 5th day and the 5th month of Chinese calendar. It is known as Pe Cun festive, when people will eat bacang (a steam rice filled with meat and wrapped in leaves) or kwecang. They are known as rice dumplings in the western world. Most of the collection of Benteng Heritage are located in the second floor. The rules in this floor: we must take off our shoes, we are not allowed to take pictures, and we forbid to touch the displays, especially the railing. In the second floor, the railing is a wooden fence in a void between the roof to the ground floor. On the third floor, the attic, it is decorated with relief sculpture made of solid stone. The relief depicts the famous Chinese story of Sam Kok, also known as the Three Kingdoms epic. We, at ExploreSunda.com, believe this is the most precious collection of Benteng Heritage. Benteng Heritage has two solid wooden door facing the balcony on the second floor. That’s where the tour leader showed us how people used to create a locking system to their entrance door, without a lock or padlock. Benteng Heritage also has a collection of wedding clothes. Presently, some of the Benteng Chinese still perform the traditional wedding ceremonies called Cio Tau. tiny shoes wore by women in the past, due to the belief that the beauty of a woman depended on the size of her feet, the smaller her feet, the more beautiful she was. game boards such as mahjong and domino. antique porcelains dining wares, including the broken ones. an altar, complete with the Chinese gods. At the end of the tour, we will pass a small souvenir shop. We can buy local products, such as the famous soy bean sauce called SH. 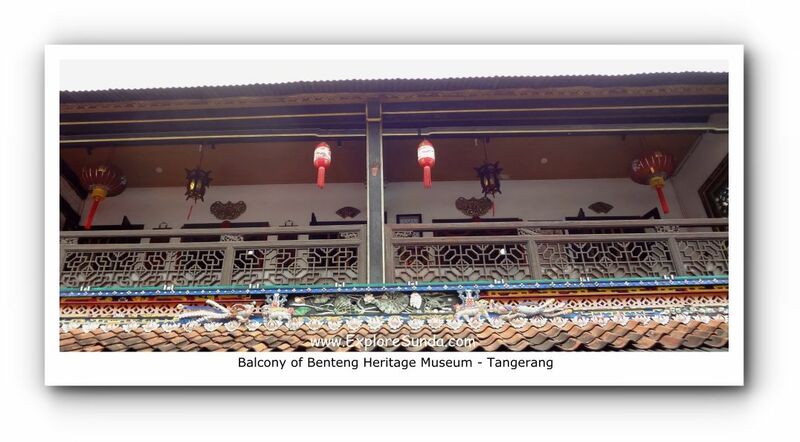 Should you interested in history, culture, and artefacts, Benteng Heritage Museum is a recommended place to go. The place itself is simple, but the collections speak volumes and the tour guide is very explanatory. 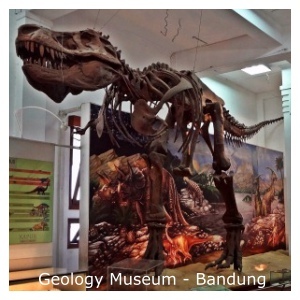 Have you seen other museums in the land of Sunda?